Can a Felon Become an Optometrist? Often, felons must look at different a career path once they are released, sometimes including returning to school for additional education. There are resources available even though felons may not believe they can find a job. While serving their sentence, some felons might consider a career in medicine or healthcare. They could explore a career as an optometrist. 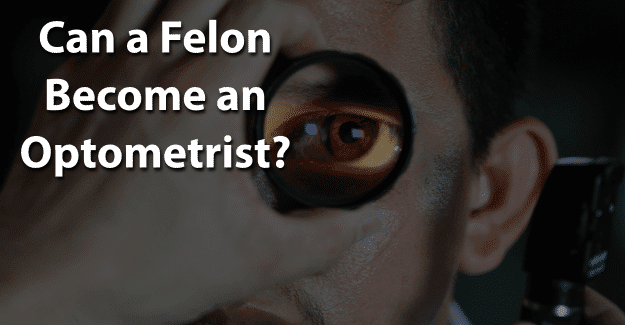 This blog post will address the issue of whether or not a felon can become an optometrist. What Education/Training Does an Optometrist Need? How Much Does an Optometrist Earn? An optometrist is a licensed professional that examines the eyes and other parts of the visual system. The main function of an optometrist is to provide vision care, including eye exams and prescribing corrective lenses. He or she also diagnoses and treats visual problems and manages diseases and injuries of the eyes. In addition to prescribing glasses and contact lenses, an optometrist also prescribes vision aids and vision therapy. An optometrist is not licensed to perform eye surgery, although he or she can provide care before and after an operation. A candidate to become an optometrist must first complete a bachelor’s degree, which should be in a field that is related to optometry, such as biology or physiology. An optometrist must then complete a doctor of optometry (DO) degree, although a candidate does not go to medical school. A candidate may apply for admission to an optometry program. In 2016, there were 20 accredited O.D. programs in the United States. To be admitted into an optometry school, someone must pass the Optometry Admission Test (OAT), administered by the Association of Schools and Colleges of Optometry. O.D. programs typically take four years to complete. They combine classroom learning and supervised clinical experience. All states require an optometrist to be licensed. To get a license, a candidate must have an O.D. degree from an accredited optometry school and must complete the National Board of Examiners in Optometry exam. Each state has its own Optometry Board under the National Board of Examiners in Optometry and requires candidates to pass a comprehensive exam. Some states also require individuals to pass an exam on laws relating to optometry. The U.S. Bureau of Labor Statistics states that there are approximately 40,200 licensed optometrists in the United States. The median annual pay for optometrists was $106,140 in 2016. The median is that salary at which half are below and half are above. Experience will make a difference in how much an optometrist earns annually. The area of the country in which an optometrist works also makes a difference in their earnings. Those on the East coast typically earn more than an optometrist that works elsewhere. The job outlook for optometrists is strong, with a growth of 18% expected between 2016 and 2026, which is above average as people become older and have increasing vision problems. A felon can pursue any degree he or she wants. Approximately 60% of colleges consider criminal history in their admissions process, although there is no standard policy regarding a background check. For many colleges the background check is a single question on the application regarding criminal convictions. Any felon that wants to get a degree in preparation for becoming an optometrist can find a college that will accept him or her. A felon may have difficulty getting accepted into many optometry schools, but there are programs that will accept a felon. Many optometry schools require a national background check upon an applicant’s initial acceptance to optometry school. The reason for performing criminal background checks is to determine the ability of a student to meet the requirements of clinical education sites and to become a licensed optometrist. The background check prior to any practicum is due to the regulations set by the practice sites. If this check shows any legal issues, a student may not be allowed to complete the program and will not be eligible to become an optometrist. A comprehensive background check will be completed upon acceptance to most schools. The results of the background search do not include juvenile records. All applicants for an optometry license are required to submit fingerprints. A license will not be issued until the fingerprints are submitted. It is important to be honest while filling out an application when applying for optometry school or licensing as an optometrist. If a felony isn’t disclosed but is found on a background check, this constitutes fraud and is punishable. It is a crime to falsify an application, which could result in being sent back to prison. In order to be successful as an optometrist, it is essential for felons to be honest about their background. They are already viewed with negative perceptions of being dishonest, untrustworthy, and unwilling or unable to follow directions from authority figures. Having their record expunged can give them the chance needed to begin with a clean record and succeed in becoming an optometrist. Expunging a criminal record allows anyone to honestly state on an application that he or she has not been convicted of a crime. It is a big challenge, but it might be worth it for a felon wanting to become an optometrist. Having his or her record expunged and also documenting any training programs or additional education could make the essential difference in a felon succeeding. What do you think about this blog post? Have you or someone you know been in the situation of trying to become an optometrist with a felony? What was that like for him or her, and how did he or she achieve success? Please tell us in the comments below.